Claire Hooper, Mel Buttle to host The Great Australian Bake Off. 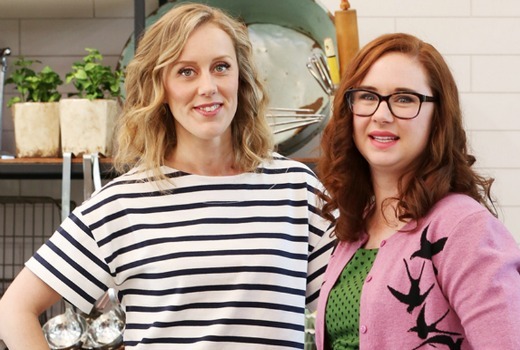 It’s not often that two female hosts have fronted a Reality TV show in Australia, but comedians Claire Hooper and Mel Buttle will do just that on The Great Australian Bake Off for the LifeStyle Channel. They will be joined by Maggie Beer and Matt Moran as judges. “This job is two dreams come true for me. To be on the right side of the camera for tasting the bakes, and to co-host with a funny friend. Mel and I have never worked together before but she’s one of my absolute favourite comics and I don’t mind at all if she ends up making better baking puns than me on camera. My mouth will be full anyway,” said Hooper. Mel Buttle added, “I can’t believe I got the job! I have no hospitality or restaurant experience at all; however I did spent most afternoons during my uni days watching Ready Steady Cook and Huey’s Cooking Adventures. I think those afternoons have just paid for themselves. It will premiere on LifeStyle FOOD later this year. I love this. It’s going to make it just like the British one! Both of these comics are awesome. Very Good! ps. they’ve done a very good job of taming Mel Buttle’s hair, I almost didn’t recognise her. It’s a little sad that Australian broadcasters/producers seem incapable/afraid of coming up with simple ideas like this themselves, but encouraging that when they do it can often surpass the originals (e.g. Selling Houses, Masterchef, etc). The Nine version was pretty dire (and suffered from being neither fish nor fowl) but, despite not being a great fan of either Ella or Mel, they could actually pull it off if they rein their usual OTT-zany personas in a bit. And it no doubt has a better chance on Foxtel where pressure is lower & the UK original was reasonably popular. Isn’t Hot Plate a simple idea devised locally? Nope. The format was devised by Endemol for Nine, not created overseas. I’m not suggesting it isn’t derivative, but much of TV is a variation of a similar format. In the world of formats that’s how we define an “original” format. As to whether it is any good or not, I have no idea. But that was not the argument. Ok, from that perspective its original but a cooking show which looks is eerily similar to another cooking show (MKR), it’s hardly origanal. Don’t know. No doubt you’re more across it than I am, but from outside it looks like a mish-mash of MKR/MRR & similar with a thin veneer of MasterChef laid over the top. I just hope they stay true to the British version and not try and turn it into a battle between state versus state, or blondes versus brunettes or whatever the overly hyped voice over guy gets a hernia over. It is supposed to be a cooking show.